A Bitter Herb . . .
Wildflowers of the West Village celebrated its second anniversary on March 22nd. What pleases me most at this point in my urban nature study is that despite the circumscribed area in which I explore, I am still finding new species of wildflowers to observe in situ and describe in words. One such plant I first discovered in bloom as early as February. This was in part not so surprising because of the mild weather the New York region experienced this past winter. 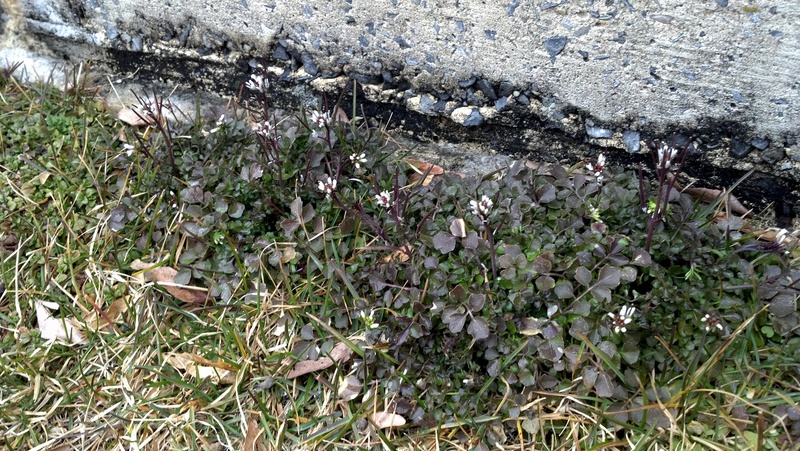 I found several examples clinging to a few sheltered corners of the damp lawn on Pier 45. This plant intrigued me. Its form reflected the kind of low profile and delicate beauty one associates with the kind of wildflowers found in tundra environments. Considering the time of year and the cold, spongy quality of the grass on the Hudson River piers, the comparison was understandable. 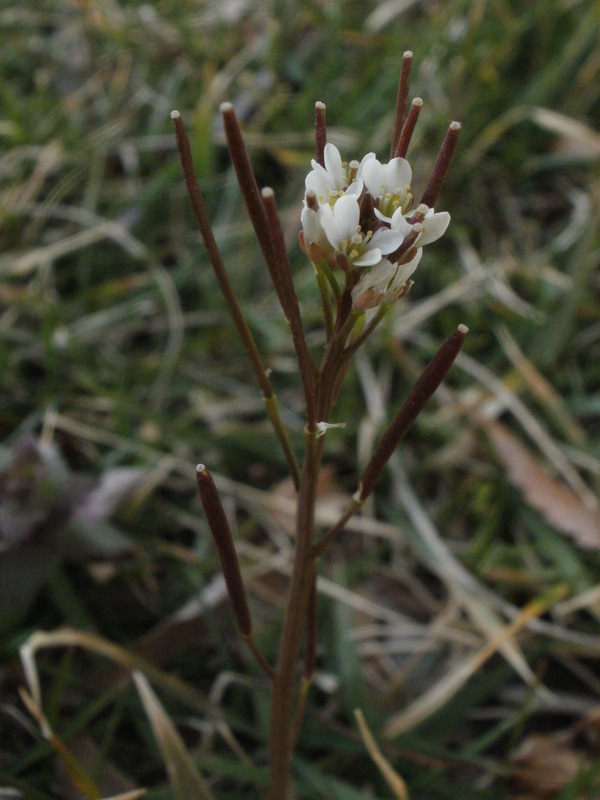 Once March arrived and the days turned steadily from cool to almost warm, I began to see examples of the mystery wildflower hugging the edges of park lawns and empty lots all around the area. The plant resembled a composite of several species with which I was already familiar. 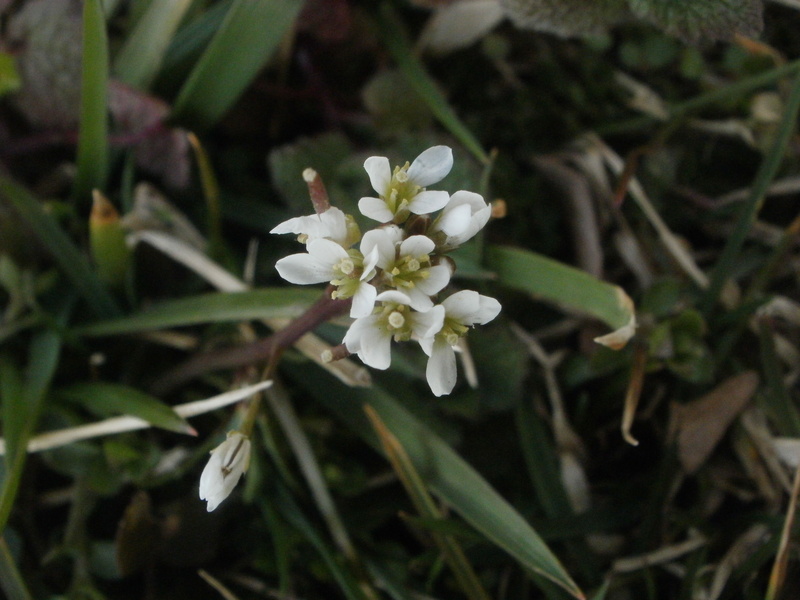 The flowers, like Shepherd’s Purse, were arranged in a tight cluster supported by a central stem that ranged from green to purple; each bloom had four tiny white petals. 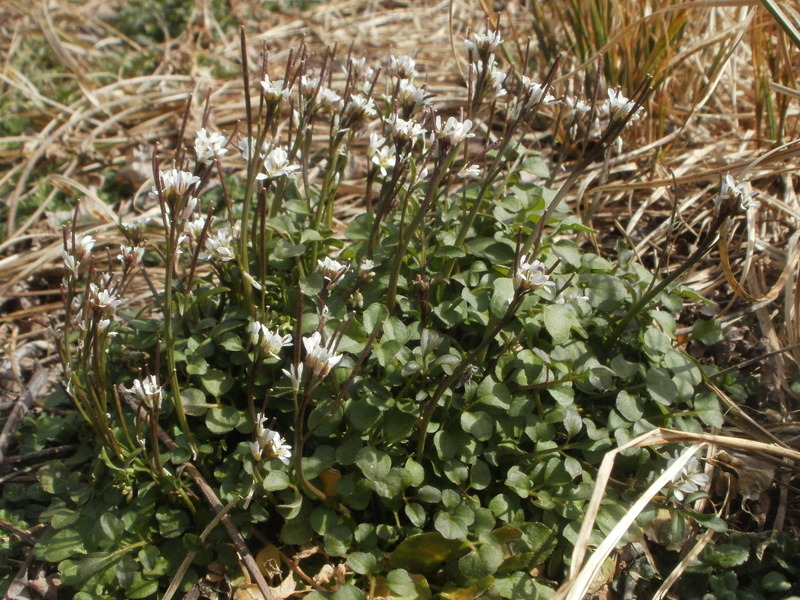 The flower heads were surrounding by thin upright silique like Garlic Mustard. The leaves were basal, compound, odd pinnate, each leaflet being roughly ovate like the Watercress sold as a salad green at neighborhood farmer’s markets. This annual species, like other wild mustard immigrants from Europe, is as edible as it is invasive. The flavor has a spicy, slightly pungent bitterness, thus the popular name. With the Pesach festival, the Passover holiday, being celebrated during this period, I find it ironic that the subject of my recent investigation turned out to be one qualified to fill the role of the maror – a bitter herb – a central element of the traditional Seder plate.